Thai food is my all-time favourite food. I love fried chicken and some of the most flavourful fried chicken in the world are from Southeast Asia, for example, this crispy, moist, juicy and extremely delicious Thai Crispy Chicken. I have tasted the Thai Crispy Chicken once we have food from outside I don’t know where it from. But I still cannot forget the taste of that Thai fried chicken. Thai crispy moist fried chicken captured my mind and I decided to search for the recipe and try it at home. I have seen many Thai fried chicken recipe. The only problem was that the unavailability of the ingredients in our place. So I chose a simple form of the Thai fried chicken. 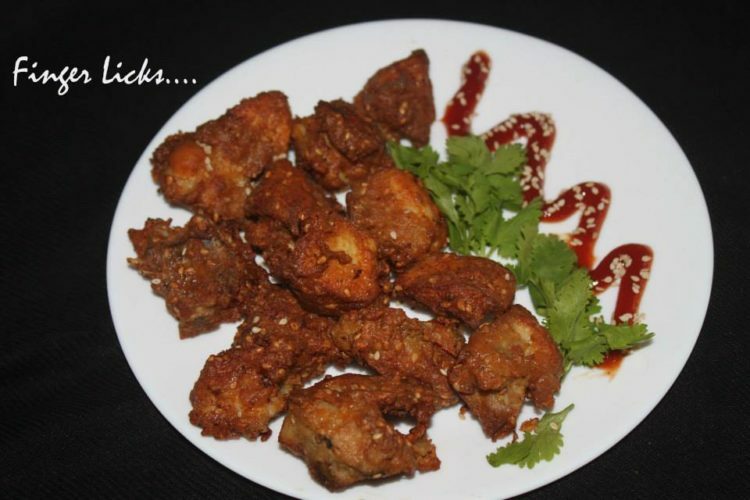 The main step in the recipe is the marinating the boneless chicken in the batter it is a special batter contains of red Chilli paste, Garlic paste, White sesame seeds, Egg, Corn flour, Soya sauce, Salt . Although this recipe is for “fried chicken” it doesn’t use too much oil and it is a good oil! Ensure that your pan is HOT prior to adding the chicken to avoid having the chicken absorb it. Mix Red Chilly paste, Garlic paste, White sesame seeds, Egg, Corn flour, Soya sauce, Salt in a bowl. Marinate chicken in this mixture for half an hour. Heat oil in a pan. Deep fry the marinated chicken.